Here I go again with the coconut! 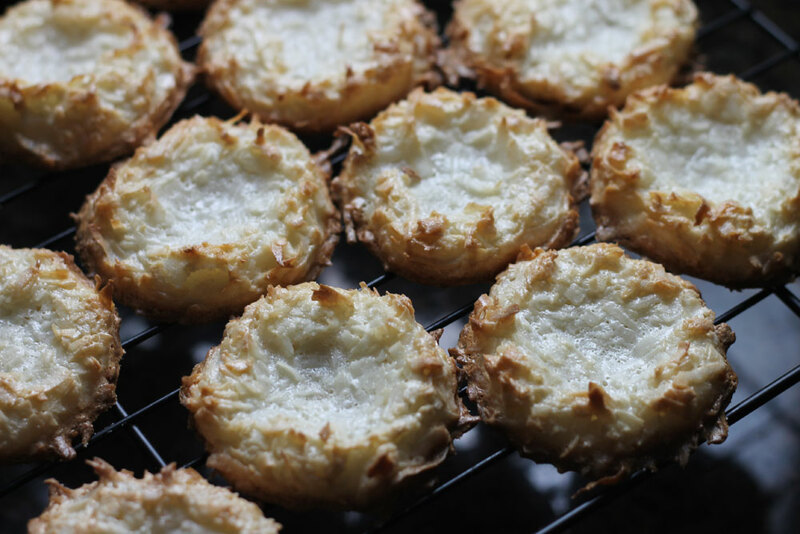 I LOOOOOOOVE coconut macaroons and so does my family. 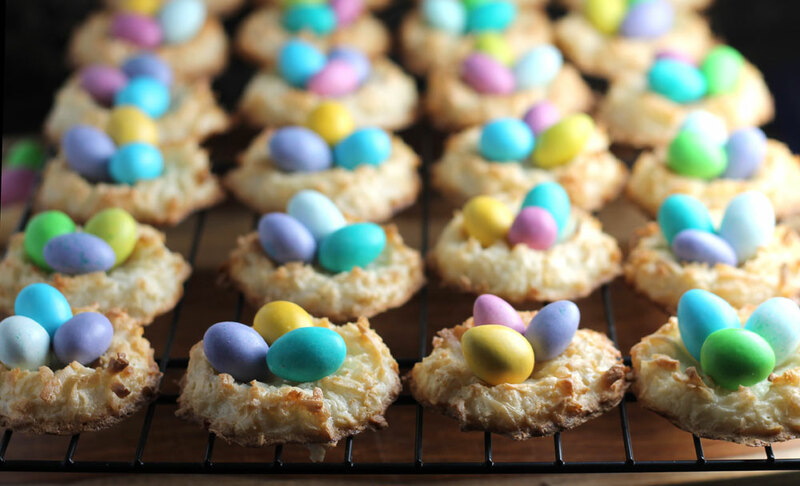 For Sunday’s Easter brunch I thought it would be cute to make bird nest macaroons for everyone, especially with all the egg-shaped candy in stores right now. I picked up two kinds of M&M’s. The solid color on the left are almond and the speckled ones on the right are the new coconut flavor they have – both are perfect for macaroons. Macaroons are pretty easy to make and don’t take many ingredients. The recipe I used today is a bit more involved, so if you have another favorite recipe, feel free to use that one instead. Once all of the ingredients for the macaroons are mixed up, scoop tablespoonfuls onto a parchment lined baking sheet. Press down the center of the mound and shape each one into the nest shape you want. You can just use your hands, but I imagine the back of a measuring spoon would work as well. Since these macaroons aren’t the usual rounded mound shape, they take fewer minutes to bake. Instead of the recommended 20-25 minutes, try 18-22 minutes. Once cooled, all you need to do is add the egg candy. If I were serving these at home, I would have left them as they were, with the eggs resting inside the nests. Because these nests are hitting the road, I just used a bit of melted chocolate to secure the eggs. I didn’t want a pool of chocolate on the nests, so I just dipped the ends of the M&M’s in chocolate (just enough to make them stick) and placed them inside the nests. I should resolve to not make anything with coconut for at least the next five recipes. Yes, these are really weight measurements. 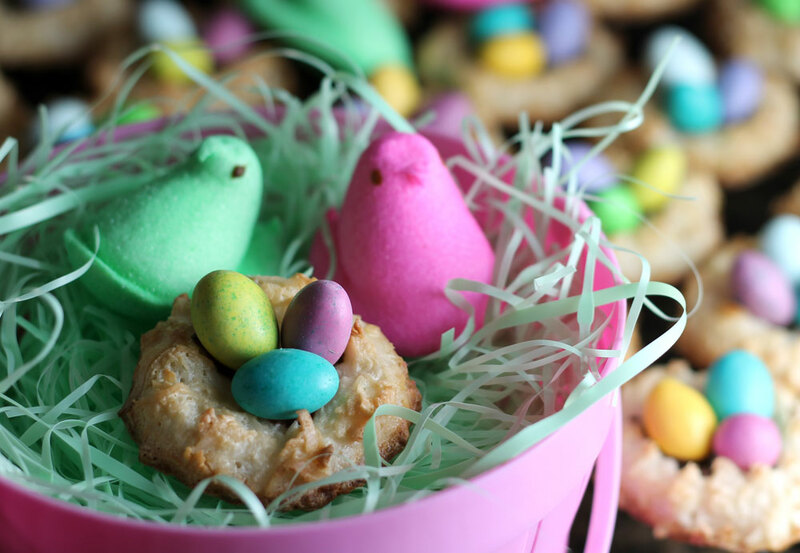 This recipe makes about 30 nests. Combine the coconut with the sweetened condensed milk, salt and vanilla in a medium mixing bowl. In a separate large bowl, beat the egg whites on medium speed until foamy. Gradually add the sugar and continue to whip the whites until medium peaks form, 6 to 7 minutes. Gently fold the egg whites into the coconut mixture. Scoop tablespoon-sized mounds onto a parchment-lined half sheet pan. Shape each mount into the nest shape and bake for 20 to 25 minutes or until golden brown. 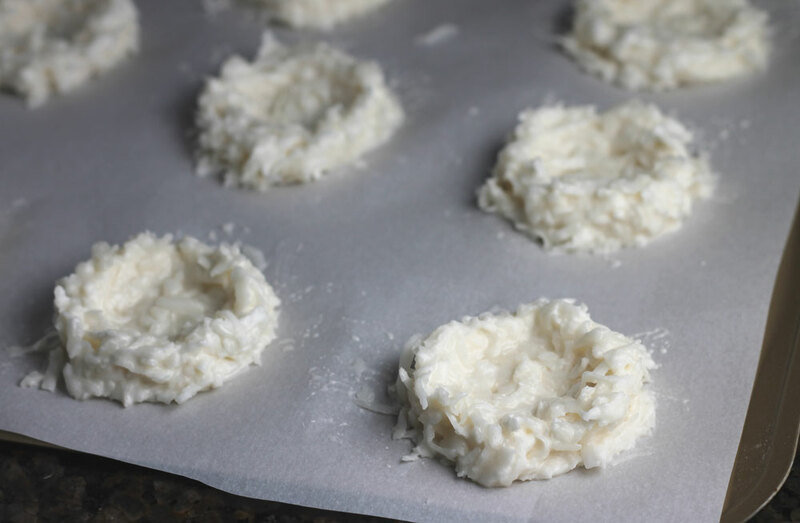 Immediately transfer the parchment with the macaroons to a cooling rack. 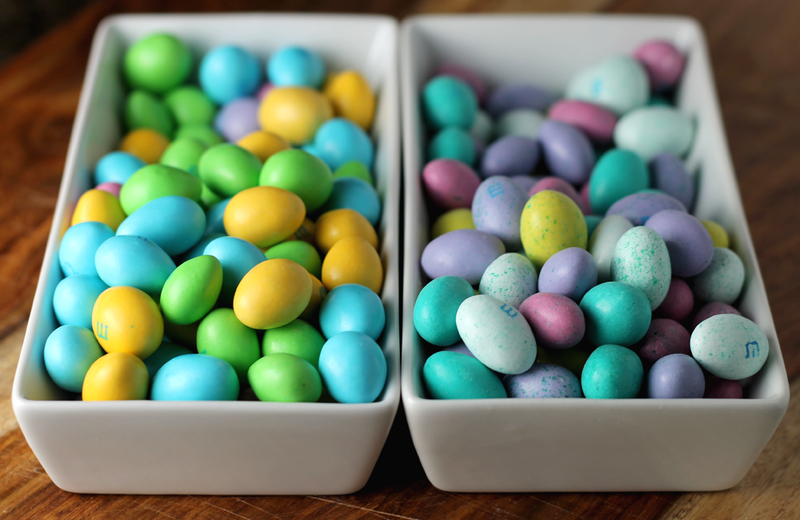 If using chocolate to hold the eggs to the nests, just melt the chocolate (any kind is ok) in the microwave at 30 second intervals, mixing occasionally until smooth. 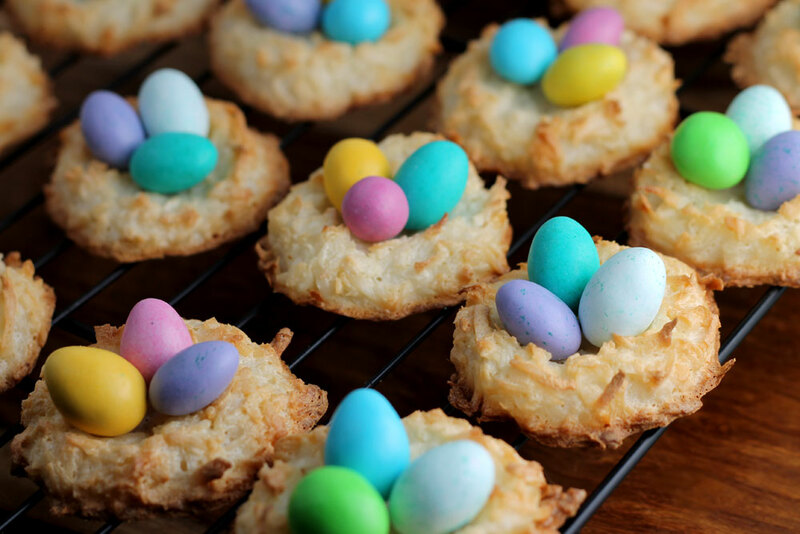 Dip the ends of the eggs into the melted chocolate and place the eggs in the nests. Once the chocolate has cooled, they will be safe to move around without the eggs falling out. Store the macaroons in an airtight container, assuming you don’t scarf down the entire batch within minutes.